*For maximum speed and power pre-treat or soak. **Across Vanish Pink Gold Powder and Gel. Safe on everyday fabrics***, colours and whites. ***Every day fabrics like cotton and polyester. 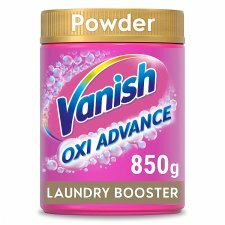 VANISH Gold Oxi Action Powder Fabric Stain Remover. Contains Sodium Carbonate Peroxide, Sodium C14-16 Olefin Sulfonate. Causes serious eye damage. Causes skin irritation. Keep out of reach of children. Do not get in eyes, on skin, or on clothing. Wear eye protection. Wash hands thoroughly after handling. IF IN EYES: Rinse cautiously with water for several minutes. Remove contact lenses, if present and easy to do. Continue rinsing. Immediately call a doctor. IF SWALLOWED: Call a doctor if you feel unwell. For sensitive skin, the use of gloves is recommended. Clean & dry the scoop before placing back into tub. Always follow washing instructions on garment or fabric label. Check for colour fastness by testing a hidden area of the fabric. Rinse and allow to dry. For best results, it may be necessary to repeat parts of the process. Do not use on any garment or rug made of wool, silk or leather. Do not use on finished or coated surfaces - for example wood, metals etc. Do not soak fabrics with metal fasteners or flame-resistant finishes. Do not expose pre-treated or soaked garments to sources of direct heat or direct sunlight before washing or rinsing thoroughly. Do not contaminate the product in the tub. Once mixed, do not leave solution in a sealed container. It will continue to give off oxygen and the container may build up pressure and may leak. Reclose lid after each use and keep Vanish in a cool dry place. Keep container dry in a cool place.